First Look: 2017 Benelli Super Black Eagle 3, the Best Ever? It is hard not to notice the current, trendy shotgun hyperbole: it is like all marketing departments ride in the same bus. Just what doesn't have better ergonomics, pointability and swing-ability? When all else fails, just claim “advanced ergonomics” and call it good seems to be the order of the day. Lately, many shotguns have larger trigger guards, extended bolt handles, and larger bolt release buttons. Who really thinks that hunters and shooters over the last century didn't care about pulling the charging handle on autoloading shotguns, loading it, and hitting the bolt release button? If you read enough ad-copy, you'd have to believe that everyone's father, grandfather, and great-grandfather spent their lives living under a rock, not understanding at all how to swing a shotgun or kill a duck. I'm trying to remember when, over the last fifty years of hunting and shooting I found myself having an actual problem opening or closing an “ancient” Automatic-Five, and it hasn't happened yet. The Super Black Eagle has been the standard-bearer for the last twenty-five years or so for the Benelli brand. In fact, Benelli lists the Super Black Eagle II - 25th Anniversary Limited Edition 12-Gauge 3-1/2 inch for $1999 on their website, weighing 7.3 lbs. The Super Black Eagle 3 is a refinement of the Super Black Eagle, answering two longstanding gripes about Benelli in general: the Benelli click and the Benelli thumb. Along the way, the Super Black Eagle 3 had become about a quarter pound lighter and the Comfortech stock has also been revisited. Certainly, a brief stint with 1-1/8 oz. target loads in Las Vegas is a very long ways from a full review, and cannot speak to how the gun feels and works with game loads, goose loads, much less monster 2 oz. or 2-1/4 oz. lead turkey loads that are uncomfortable out of essentially everything. Nevertheless, it sure seems to me that Benelli got about everything right with the SBE 3. I like the new forearm, the SBE3 is very, very easy and smooth to load, and it appears the “Benelli click” has been eliminated. Although it is right at 7 lbs., it is the softest-shooting Benelli I've ever fired, so the Comfortech 3 stock is working and working extremely well. Of course, I've not done any patterning and so forth and this as a result can not be a full review. 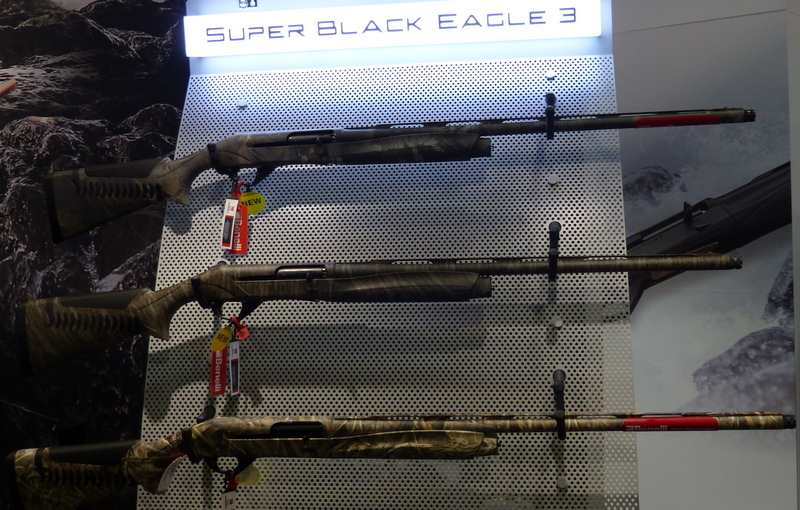 However, I have no problem saying that the Super Black Eagle 3 appears to be the best inertia gun on the market, the best Benelli ever made, one of the best hunting shotguns on the market, and one of the best new shotgun offerings of 2017. Copyright 2017 by Randy Wakeman. All Rights Reserved.